There’s a lot of buzz around 802.11ac and the new Cisco Meraki MR34 access point. Here’s what you need to know about 802.11ac technology. Along with the introduction of the Cisco Meraki cloud-managed 802.11ac access point, the MR34, there’s a lot of buzz in the industry around 802.11ac. After all, it’s the next generation WiFi standard, and brings significant speed improvements to WiFi networks. To help you better understand the technology, here are four key points you should know about 802.11ac. 802.11ac increases the maximum data rate for a single client quite a bit compared to 802.11n. 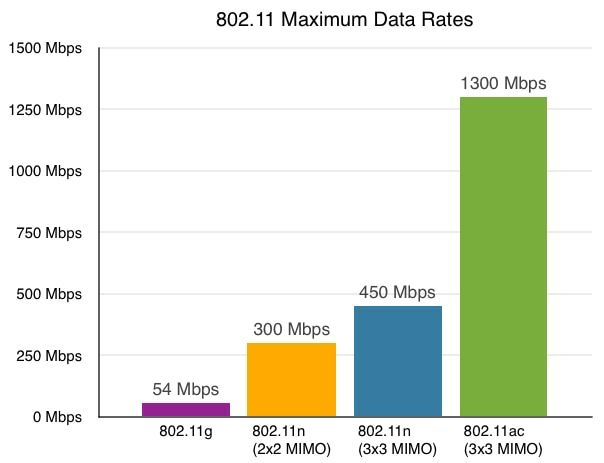 Most of the first 802.11ac access points use triple-stream MIMO, similar to today’s top-end 802.11n access points, but will have a maximum data rate of up to 1.3 Gbps. The increase comes from using 80 MHz channels and a new modulation scheme (256 QAM). As the technology matures, the maximum data rate will further increase by taking advantage of even more MIMO streams, but that won’t come for some time. 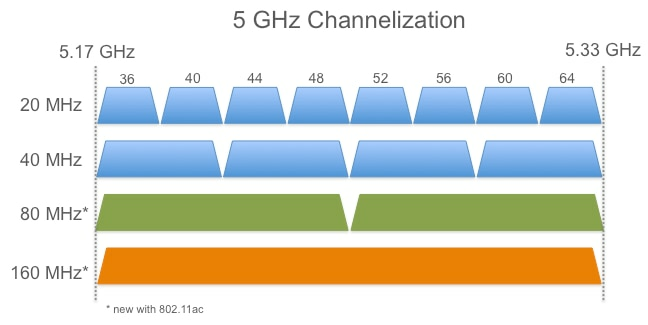 Note that the above figure compares 802.11ac 80 MHz channels with 802.11n 40 MHz channels. Yes, 802.11ac will only work on the 5 GHz band. Nearly every wireless client supports the 2.4 GHz band, but unfortunately the band suffers from high interference levels and is quite crowded. In nearly all environments, the 5 GHz band doesn’t suffer from as much interference or crowding as the 2.4 GHz band, and 5 GHz has more spectrum available for WiFi channels. 802.11ac channels will be 80 MHz wide (compared to the 20 MHz or 40 MHz channels of 802.11n), with the option to spread out to 160 MHz channels in the future, although at double the channel bandwidth compared to 80 MHz, there will only be half as many channels. The figure below compares channels of 20 MHz through 160 MHz bandwidth in the lower half of the 5 GHz band. 802.11ac falls back to 802.11n to serve clients that don’t support 802.11ac. This works very similarly to how 802.11n falls back to serve 802.11b/g and 802.11a clients today. Dual-band APs like the MR34 will seamlessly serve 802.11ac and 802.11a/n clients in the 5 GHz band, and 802.11b/g/n in the 2.4 GHz band. Backwards compatibility is a key point since nearly all deployments will be dual-band and therefore will need to support 802.11n for years to come. Over the course of this year we’ve seen 802.11ac clients and APs come to market, but it will be some time before 802.11ac becomes most new laptops and some smartphones support it. Due to the backwards compatibility of 802.11ac with 802.11n, and because 802.11ac is limited to 5 GHz only, 802.11n will still be around for years to come. Already today, 802.11n is widely used to support rich services such as voice, video conferencing, and video streaming. There are other exciting developments in 802.11ac, such as multi-user MIMO (MU-MIMO) and closed-loop beamforming, but they will take more time to become widely adopted by access points and clients. In the meantime, we’ll keep you up to date on important news as 802.11ac moves forward.